Call, Don't Email: Confirm your wiring instructions by phone using a known number before transferring funds. Don’t use phone numbers or links from an email. 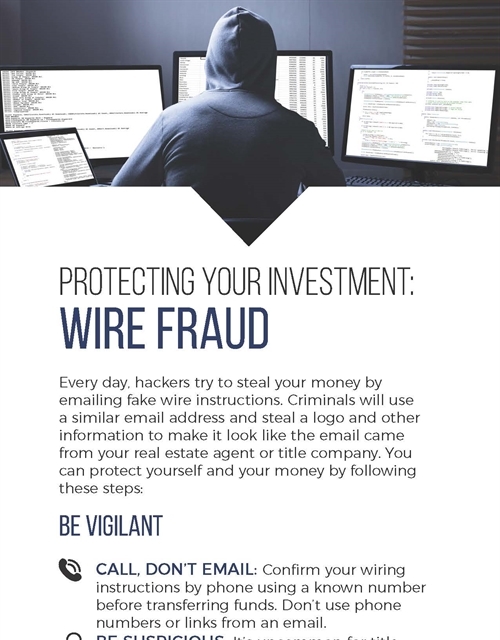 Be Suspicious: It’s uncommon for title companies to change wiring instructions and payment information by email. Confirm Everything: Ask your bank to confirm the name and the account before sending a wire. Verify Immediately: Within four to six hours, call the title company or real estate agent to confirm they received your money. Immediately call your bank and ask them to issue a recall notice for your wire. Report the crime to www.IC3.gov. Call your regional FBI office and police. Detecting that you sent your money to the wrong account within 24 hours is the best chance of recovering your money.